Is it any surprise that, with a tremendous sweet tooth, I also possess a rather insatiable appetite for salty snacks? In fact, beginning in grade school, I would religiously eat (I did attend Catholic School, after all) a bag of Popcorn as soon as I was off the school bus and through the front door. Homework could wait. "Junk" food was calling. My tastes were simple - Butter & Salt. There were no options. The universe of Popcorn was small and easy to understand. But the early 1990's brought an explosion of microwave Popcorn flavors, thanks to a body of food scientists that would put powdered flavoring on anything. Kettle Corn, Nacho Cheese, Chocolate... they were all possible (although Chocolate must have been a failure, because it graced the grocery store shelves for mere months before disappearing forever). But Fruit-Flavored Candied Popcorn remained elusive. The microwave just isn't a capable tool for the candying process. It would seem that I had other, more pressing concerns over the two decades that interceded, but it wasn't until this past Christmas that I gave Fruit-Flavored Candied Popcorn much thought. It was a random discovery while wandering through Bed, Bath and Beyond -- a large, multi-colored Popcorn-filled cylinder found in the store's inexplicably large and diverse snack section. And it was only $10 (?!?!). The obscene price notwithstanding, I bought the Popcorn (actually, I bought two cylinders), but I immediately wondered how it could be made at home. Predictably, a quick Google search turned up hundreds of recipes. And like most recipes on the Internet, they were poorly written posts that appeared to exist only to be shown alongside pretty photographs. And while I believe most recipes on the Internet have never been tested, the recipes I found for Fruit-Flavored Candied Popcorn were among the worst I have ever seen. They were incomprehensibly vague. You cannot instruct someone making candy to "boil the sugar for a few minutes." Candy requires a good thermometer and degree-specific accuracy. They included ingredients that seemed wholly inappropriate, albeit convenient. Yes, Jello powder may be fruit flavored, but it's Gelatin! Why would anyone use Gelatin? They included procedures that could be simplified. Why spend an extra hour tending to Candied Popcorn in a hot oven so that the Sugar Coating will set when you could have been done in minutes if the Sugar had been heated to the appropriate temperature? In the end, I started from scratch, adopting the techniques I had used to make Rosemary Caramel Popcorn while working at Osteria Morini. Make Popcorn. Heat a Sugar Syrup to the appropriate temperature. Toss the Popcorn with the Sugar Syrup. Let the Candied Popcorn set for a couple of minutes. Eat. ... and not all Popcorn is created equal. The type of corn that is best for popping has a harder outer shell. That shell turns each Kernel into a mini pressure cooker. As the Popcorn is heated, the interior contents liquefy as the pressure builds. Eventually, that pressure is so great that the shell pops and the liquid interior bursts out to set as Popcorn. If the outer shell were weak, it would break too early resulting in meager, poor excuses for Popcorn. Fortunately, the kernels sold as Popcorn should be of this harder-shelled variety. Nevertheless, make sure that your Popcorn is fresh. Kernels lose moisture with age, and dry Kernels will also result in unimpressive pops! The popping method is also important. For this Fruit-Flavored Candied Popcorn, I recommend making air-popped Popcorn. 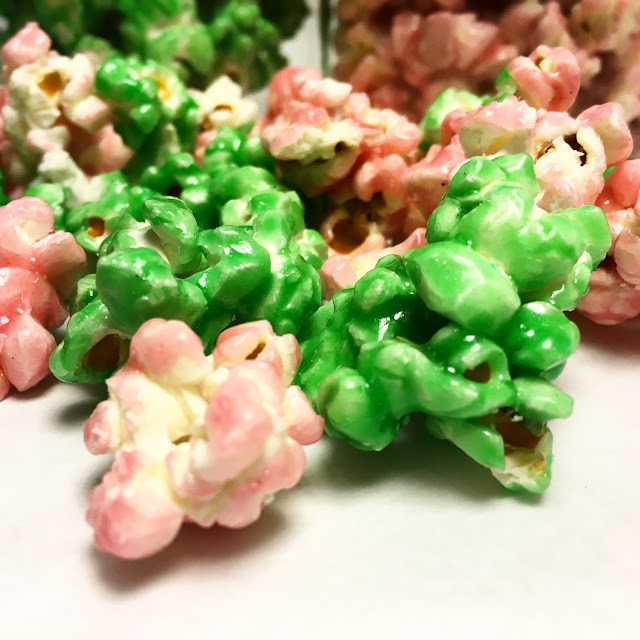 Air-popped Popcorn will be free of oils - a better starting point when you plan to add a Candy Coating. 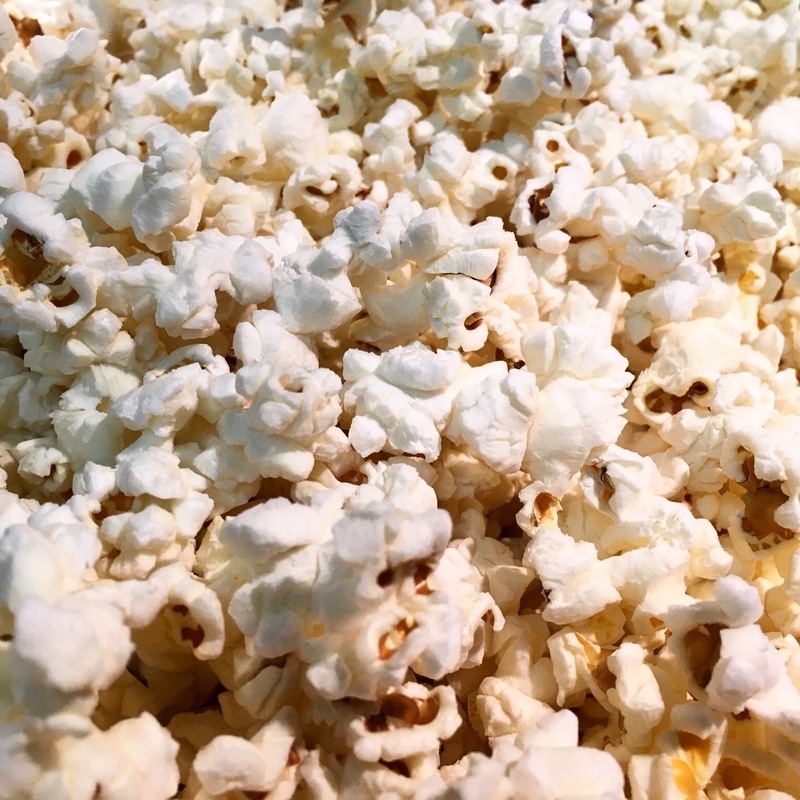 Air-popped Popcorn can be made using a dedicated air popper or in a microwave using a specially designed bowl (although you can just as easily place Popcorn Kernels in a large brown paper bag as a make-shift container). Regardless of the method, heat the Popcorn Kernels until the active popping slows and there are a couple of second between each "pop!" I do not recommend using any pre-bagged microwave Popcorn. I love them for snacking, but they are all packaged with various chemicals and coatings that make them sub-ideal for this recipe. After the Popcorn is popped, carefully sift through the Popcorn to remove any unpopped Kernels (affectionately referred to as "Old Maids"). Fortunately, the Old Maids are heavier and tend to settle to the bottom of the bowl. Once you have a massive bowl full of Popcorn, it's time to focus on the Fruit-Flavored Candy Coating. Any candy-making process, particularly those involving boiling Sugar, requires good preparation. There's no time to go hunting for tools or ingredients once you've begun. For the Fruit-Flavored Candied Popcorn, first spray a very large mixing bowl with non-stick spray and fill it with the popped Popcorn. This is where the Popcorn will be tossed with the Candy Coating. The non-stick spray makes the entire process easier, and it speeds up the clean-up process. Also spray two large spatulas with the non-stick spray and set them aside. They will be used to toss the Popcorn in the Candy Coating. Lastly, lay out a silpat or parchment lined sheet tray sprayed with non-stick spray. This is where the Popcorn will cool and harden. To make the Fruit-Flavored Candy Coating, place the Sugar, Corn Syrup, Water and Butter in a large pot and stir to combine. The pot must be large enough for the contents to triple in volume during the cooking process. Also set side a small bowl with the Fruit-Flavoring, Baking Powder and Salt. These ingredients will be whisked into the boiling Sugar mixture as soon as the target temperature is reached. Place the pot over high heat and bring the mixture to a boil. As the Fruit-Flavored Candy Coating is cooking, special care must be taken to prevent the Sugar from recrystallizing. Recrystallization can be caused by a number of seemingly insignificant acts, including gently stirring. So follow these steps to keep recrystallization in check. Once the mixture is boiling, reduce the heat to medium high. Cooking a Sugar mixture over a lower heat will take longer, but it is easier to prevent over-cooking this way. Heat the mixture to 280 degrees Fahrenheit (138 degrees Celsius), which is in the middle of the Soft-Crack Stage for Sugar. If the mixture is raised to this temperature, it will quickly set to a hard candied shell at room temperature. Lower temperatures will result in a sticky, chewy coating. Higher temperatures will start to caramelize - tasty, but not what we want here. As soon as the target temperature is reached, remove the pot from the heat and actively whisk in the Fruit-Flavoring, Baking Powder, Salt and Food Coloring. 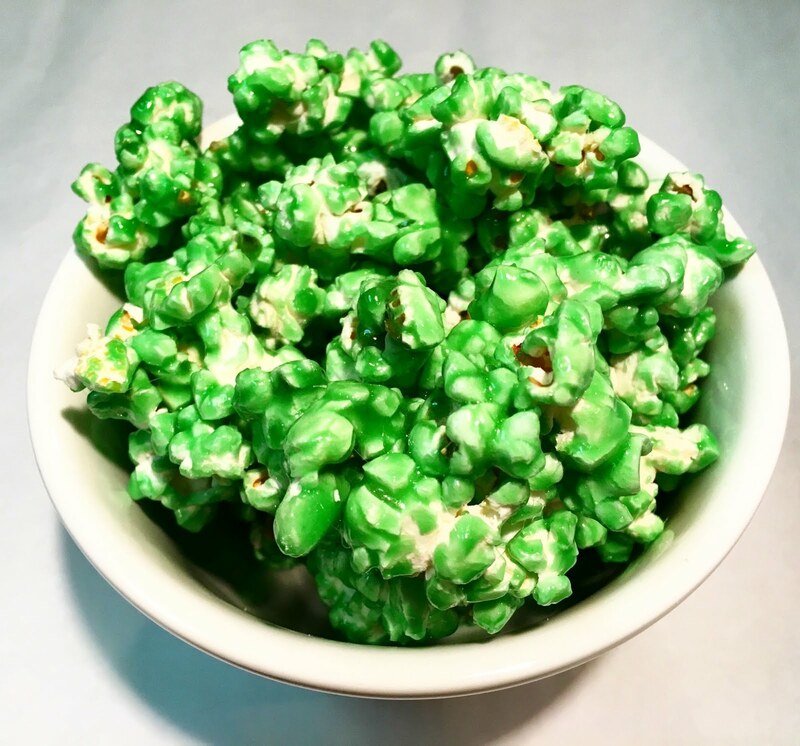 Pour the Fruit-Flavored Candy Coating over the Popcorn (do not scrape the pot) and immediately begin tossing the Popcorn. Work quickly as the Candy Coating will harden quickly at room temperature. 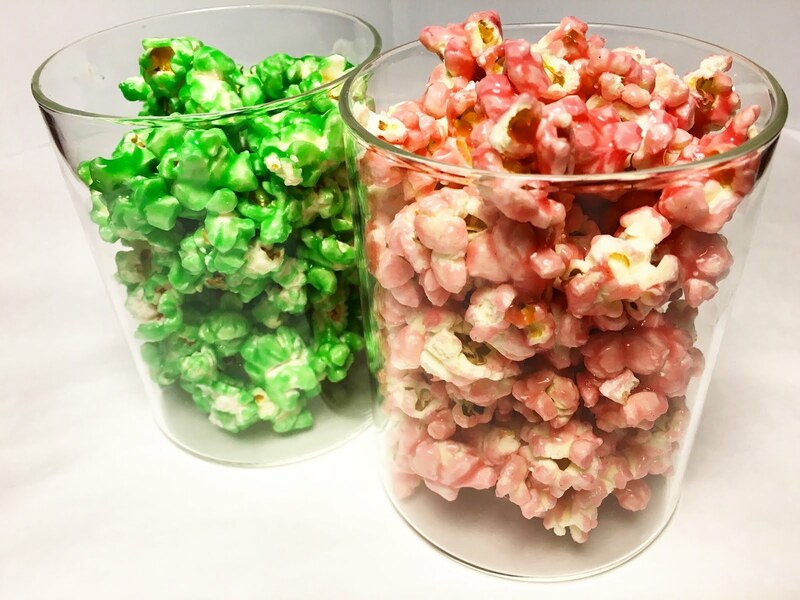 As soon as the it is fully and evenly covered in the Candy Coating, pour the Popcorn out onto a single layer on the silpat or prepared sheet tray to cool and harden. As to Popcorn cools, break up any large pieces with your hands. The Popcorn can be eaten immediately. If you have some extra time, you can create multiple flavors to create your own Popcorn Fruit Cocktail. The Fruit-Flavored Candied Popcorn will keep for several weeks when stored in an airtight container at room temperature. Gallon sized plastic freezer bags work very well. Kool-Aid is a great option for concentrated fruit flavoring, but there are a number of other commercially available powders that will also work well. Flavor intensity varies by product, so some experimentation may be necessary. Make sure to use Sugar-Free powders. Food Coloring should be added to the mixture to intensify the color, but it is not required. 1. Pop the Popcorn and set it aside in a large mixing bowl that has been sprayed with non-stick spray. Also lightly spray two spatulas with non-stick spray to use when tossing the Popcorn with the candy coating. Lastly, set out a silpat or parchment lined sheet tray that has been lightly sprayed with non-stick spray. 2. Combine the Sugar, Corn Syrup, Water and Butter in a large pot and stir to combine. Bring the mixture to a boil over high heat. Chef's Note: The pot must be large enough for the contents to triple in volume. Late, when the Baking Soda is whisked into the boiling Sugar mixture, it will foam up significantly. 3. Once the Sugar mixture is boiling, reduce the heat to medium high and continue cooking without stirring until it reaches the Soft-Crack Stage of Sugar at 280 degrees Fahrenheit (138 degrees Celsius). 4. As soon as the target temperature is reached, remove the pot from the heat. Quickly whisk in the Fruit Flavoring, Baking Powder and Salt mixture, being careful as the Sugar mixture foams up. 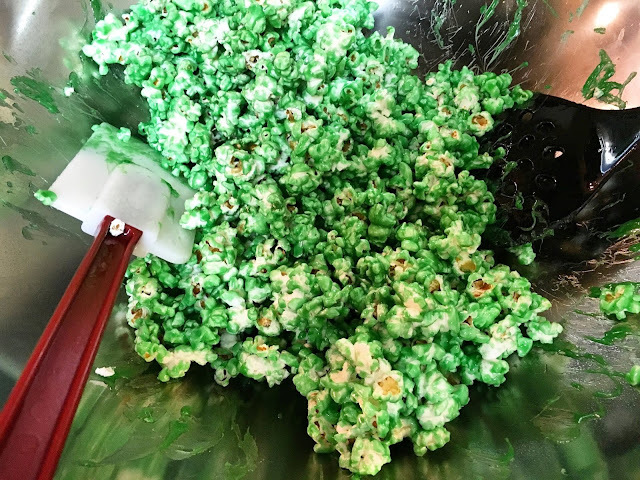 Continue whisking for a few seconds until the mixture settles and then pour the Fruit-Flavored Candy Coating over the Popcorn (do not scrape the pot) and immediately begin tossing the Popcorn. Work fast as the Candy Coating will harden quickly at room temperature. 5. As soon as the Popcorn is fully and evenly covered in the Candy Coating, pour the Popcorn out onto a single layer on the silpat or prepared sheet tray to cool and harden. As to Popcorn cools, break up any large pieces with your hands. 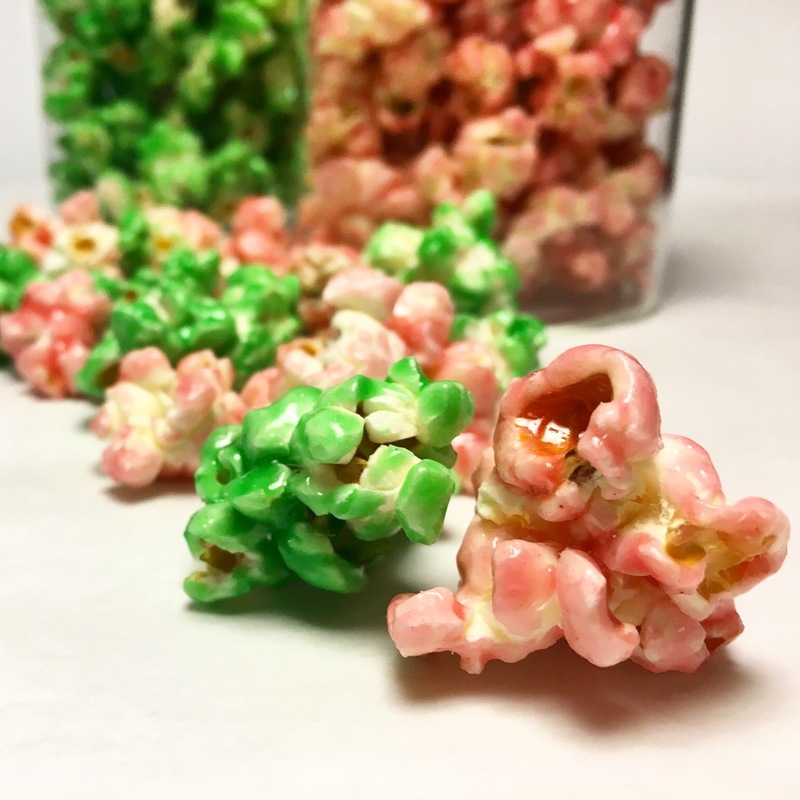 - The Fruit-Flavored Candied Popcorn will keep for several weeks when stored in an airtight container at room temperature. Gallon sized plastic freezer bags work very well.